Author: Horsfall, Rebecca Set In . . . Description: Ten years in the making, this sweeping, evocative, and graceful novel will capture the hearts of readers with its vivid portrayal of a close-knit group of friends and a love that won’t be denied. Jonni Kendal and Jean-Baptiste St. Michel have come to London separately in pursuit of their dreams. Michel is haunted by the man who abandoned him as a child. Driven by his determination to forge a life for himself outside the shadow of his father’s famous name, he’s ambitious, talented, and dangerously attractive–but suspicious of emotional attachments. Full of courage but naïve, Jonni is determined to excel as an actress. Just nineteen, she’s made up her mind to escape the narrow, parochial life her parents have planned for her. When Michel rescues Jonni one night and takes her home, there’s an immediate attraction. Jonni soon finds herself embraced by an exciting new world filled with bohemian dancers and musicians, a family of planets orbiting around their sun–Michel. But before Michel can commit to any kind of future–with or without Jonni–he must free himself from his past. And when tragedy brings him to the edge of a fiery burnout, Jonni and the pair’s friends must rally to save all they have come to count on. 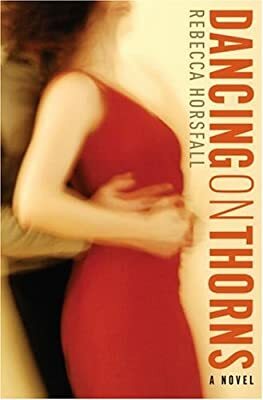 In Dancing on Thorns, Rebecca Horsfall has captured the vulnerability and passion of young artists in achingly beautiful prose. Through characters who live and love as grandly as the art that consumes them, we witness a world that is by turns seductive and heartbreaking.